Millions of people use WordPress worldwide and it is one of the most common platform for blogs and websites. It is used so widely because of its extreme ease of use and its extensibility. To make your blog/website stand out from the rest, you can use any of the plethora of themes present out there. You can customize the look of your blog according to your choice using these themes, as they allow complete transformation of the look as well as the functionality of the website.So in short, having a good theme is really important. Today we have a Top 50 Free Premium WordPress Themes 2011 for you. All these themes are really awesome yet free. 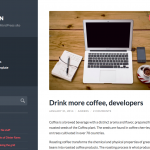 Check out the themes and pick the one that suits your blog’s needs the best! If You Like this Article , You Might be interested on WordPress Magazine Themes, Free WordPress Themes 2011,Free WordPress Mobile Themes, Excellent Free WordPress Themes and WordPress 3 Series Compatible Themes.